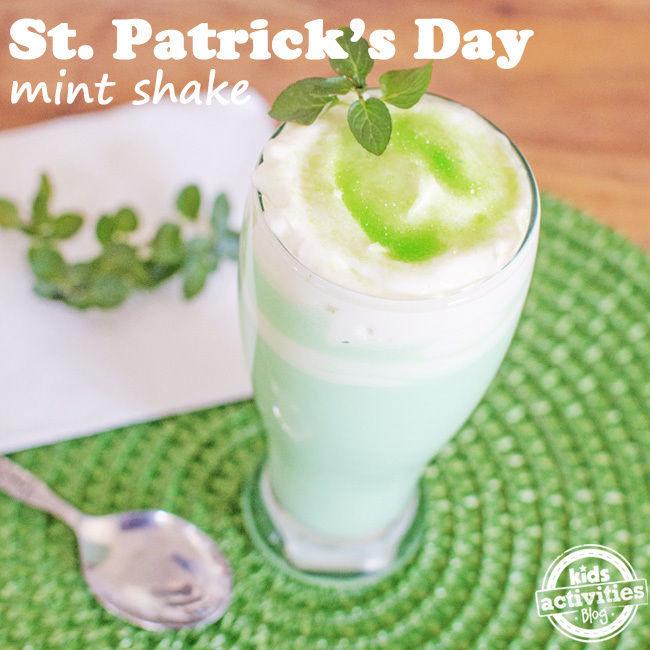 Similar to a Shamrock Shake, our St. Patrick’s Day Shake is full of minty flavor and sweetness, and makes a great green St. Patrick’s Day recipe and celebratory drink! Why drive to the drive thru with when you can make this tasty treat, in the comfort of your own home, any time of the year? You know how much we love green food to get your family in the mood for St. Patrick’s Day! 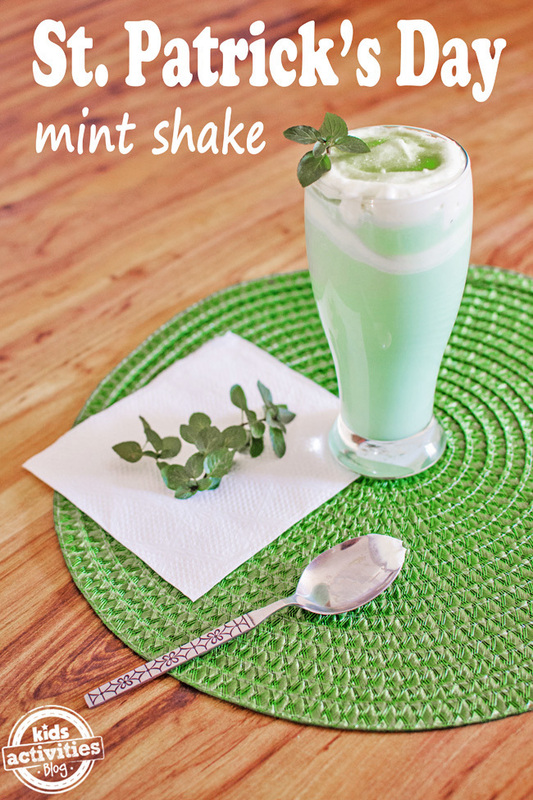 Here’s what you need to make our St. Patrick’s Day Shake! 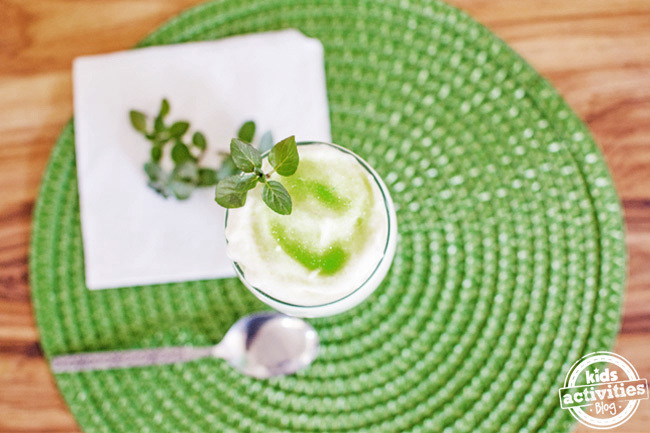 Inside a blender, add vanilla ice cream, milk, 1/4 cup heavy whipping cream, mint extract, and green food coloring. Mix until well blended, adding more milk if necessary. Alternatively, you can use a stick blender to blend the ingredients. Pour into serving glass. Top with prepared whipping cream and green sprinkles. Depending on how thick your St. Patrick’s Day shake is you might want to use an extra large straw for drinking. Conventional vanilla ice cream can be replaced with a non-dairy vanilla ice cream (rice milk, almond milk based, etc.). You can use coconut milk in place of the whole milk, since it is thicker and creamy. Replace the heavy whipping cream with a combination of coconut milk, add powdered sugar, and a touch of vanilla to taste. There are healthier versions of food coloring based from vegetable dyes, in case you have a food dye allergy to worry about. You can buy dairy free whipped cream for the topping, or you can take your coconut milk heavy cream mixture, and whip that until you reach the desired consistency. Use all natural sprinkles, also made with vegetable dye for your garnish. Check out these fun St. Patrick’s Day crafts and recipes! They will go perfectly with your green shake! Comment below with your favorite St. Patrick’s Day treat!